Over 99% of the world's population is infected with at least one potentially cancer-causing organism. It is vital for nurses and other healthcare professionals to be aware of the extent of infection-associated cancer and of how they can contribute to prevention of such cancers. Infectious Causes of Cancer, aimed principally at nurses and other healthcare professionals, considers the epidemiology and biology of infectious causes of cancer. It examines each of the infectious agents associated with an increased risk of cancer, discussing epidemiology of the infection and cancer, pathophysiology of the cancer, mechanisms, associated risk factors, and prevention of the infection and cancer. 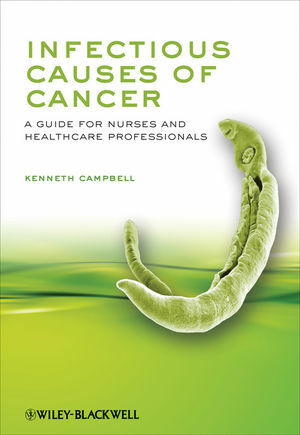 Kenneth Campbell is the author of Infectious Causes of Cancer: A Guide for Nurses and Healthcare Professionals, published by Wiley. 3 Molecular biology of cancer. 5 Public health considerations and prevention. Part I: Viral Causes of Cancer. Part II: Bacterial Causes of Cancer. Part III: Parasitic Causes of Cancer.